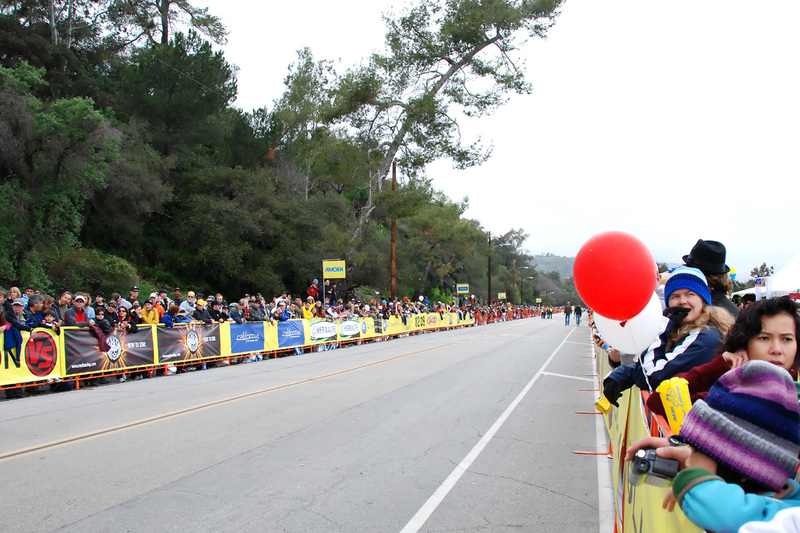 A Sunday in Pasadena with a few thousand cycling fans deserves more than one entry. Standing around prior to the race arrival one can see that the streets are dry, the sky overcast and the crowd patiently waiting for Stage 7 finish of the 2008 Amgen Tour of California. I am standing a breath away from the finish line. 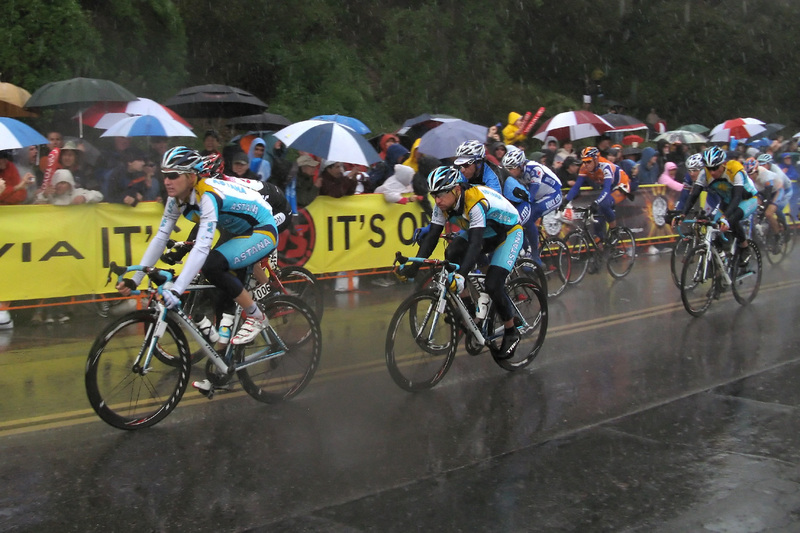 When the peloton arrives so does the rain. As they loop around the droplets get bigger. A perfect Sunday indeed. Standing in the rain for an hour watching cyclists. The prologue last Sunday was fabulous as I watched it with TBV, Mrs. TBV and spouse in Palo Alto. The riders came within inches of our cameras as they turned the second corner at Cowper and University. The company was excellent and the weather was perfect. 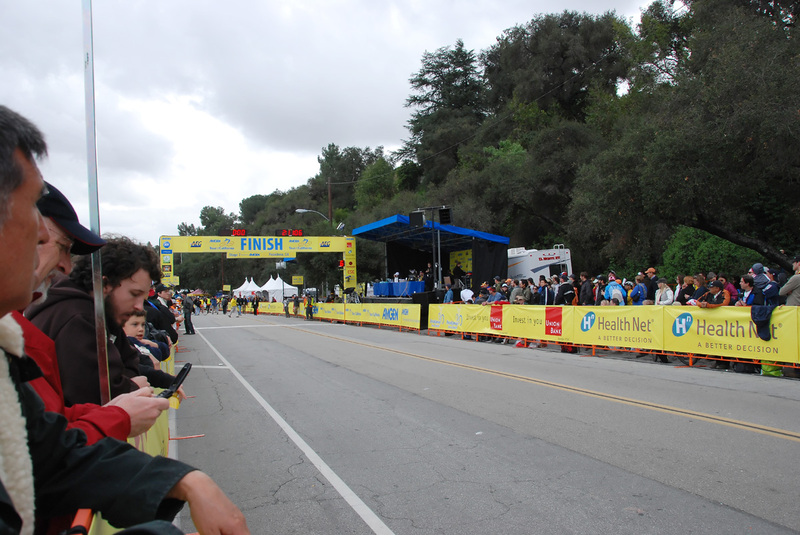 The final destination of the 2008 Tour of California ended with 6 laps around the Rose Bowl in Pasadena today. I splurged and purchased VIP tickets with access to the hospitality tents near the finish line. The tents came in handy as the overcast skies did rain down enough for the umbrellas to emerge. The hors d'oeuvre were tasty. Bits of conversation were fun. Seats were excellent. 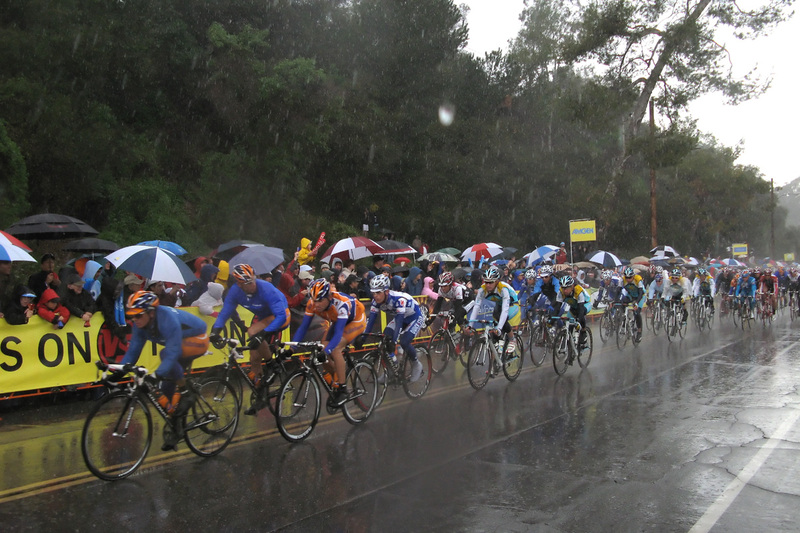 The rain started just as the riders started the circuit portion of the race. Here is an early lap. This is a later lap. See all the umbrellas? George Hincapie is on the left. Click on the image for a clearer view. Rain would not daunt me from having front row standing space within the 100 foot marker to the finish line water. I was experiencing the Tour up close, but I could have used more people standing behind me for body heat! The camera was put away to protect it from the rain. Sigh. This means fewer pictures, but I could then enjoy the real time viewing of the race. Information withdrawal was sweeping over me. Saturday I had the picture-in-picture of the Amgen Tour Tracker including the route map and gps locater map plus the tv coverage of Versus playing "live" about 10-20 minutes behind the Tour Tracker. Consider this nerd nirvana. Having attended Stage 7 of the 2007 TOC in Long Beach with the circuit laps, it is amazing to watch the peloton hunt down and over take the break away riders. Today however, the weather conditions were very wet and slick. The front riders were no challenge to the overall classification. Tom Zirbel of Bissell did a wonderful job of being in the lead for over 15 miles. But Team High Road had to wipe out the embarrassment of Stage 6 and the bidon pull of their rider Mark Cavendish from their team car after a crash with Rock Racing riders including Mario Cipollini. 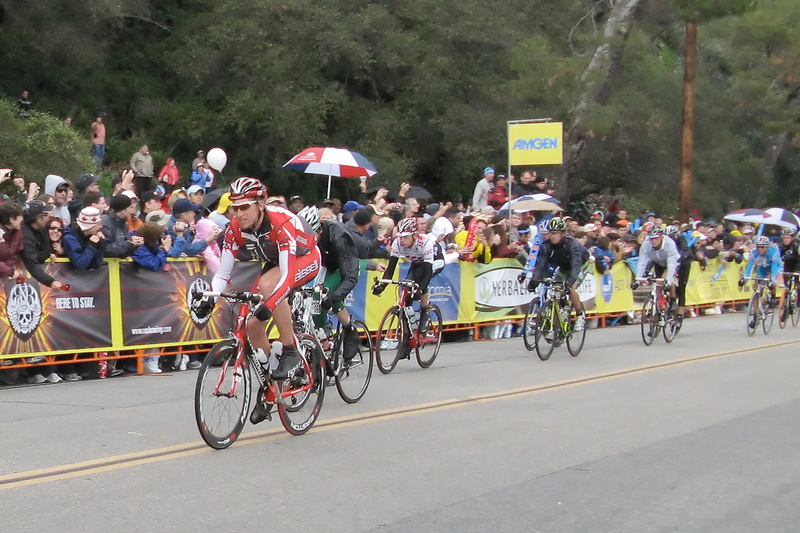 The other break away riders overtook Tom Z. in the last lap and George Hincapie made the dash to the line. I can see his face in the split second and the blur of his Team High Road jersey of white and black in the rain. Just as the Tour finished the clouds parted and a perfect rainbow was seen. I had a line of sight as Levi stood on the grandstand to receive his accolades. Perfect Tour ending. With two stages of the Tour of California attended, next on the event calendar is the CAS hearing for Floyd Landis. 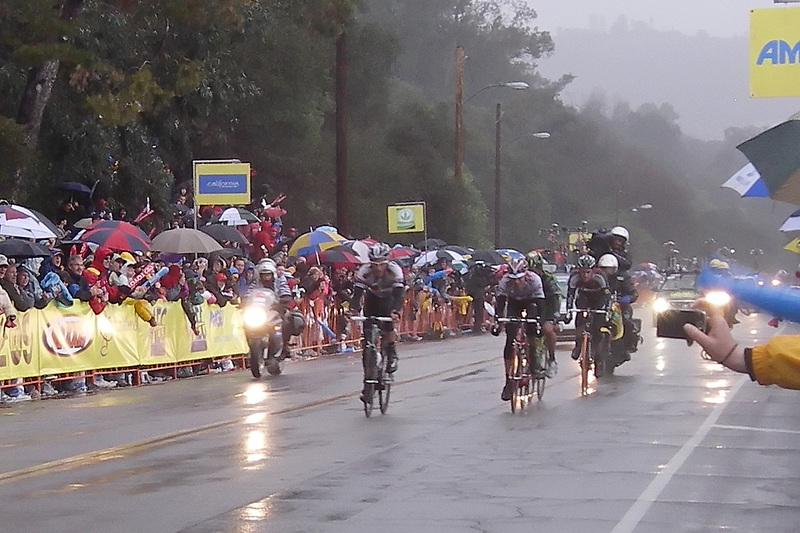 Then the San Dimas Stage Race (SDSR) March 28-30 with a 3.8 mile time trial up Glendora Moutain Road. Don't let the Levi image fool you. I support Floyd more than any other athlete past, present or future. Palo Alto a quaint college town hosted the Prologue of the 2008 Amgen Tour of California. The stately homes elegantly graced the road with their sweeping roofs and immaculate yards as we rode into a bustling downtown area. It was a flat fast 2.1 mile course with two corners. I was stationed at the second corner with TBV, Mrs. TBV and Bill. The professionals were at their "slowest" when taking the corner, and they were up close and personal as we could see their faces for that one or two seconds: grimacing, tongues hanging out, or solid and concentrated. The pictures will be here Monday. I have to admit that even with multiple snap mode many riders got cut off. Yes they were that fast! Its 10:00 pm and sleep a really good nights sleep is calling my name. TBV(s) we got home safe and thank you kindly for the conversation. It's a mere six hours before I am on an airplane to San Jose with a short commute to Palo Alto for the opening prologue of the Amgen Tour of California 2008. I am running through the list of athletes who will streak by at lightening speeds: Paolo Bettini (Quick Step), Tom Boonen (Quick Step), Fabian Cancellara (CSC), Bradley McGee (CSC), David Millar (Slipstream Chipotle) and American Favorites of Levi Leipheimer defending ATOC champion (Astana), David Zabrinski (Slipstream Chipotle), Bobby Julich (CSC), Chris Horner (Astana) and George Hincapie (High Road). Yet I realize there is someone significant missing from this list of professional athletes that should be racing, Floyd Landis. Landis' tale is best told at trust but verify. Sunday the agenda is bike racing, and the possibility of meeting the grand web master himself, TBV as well as the eminent cycling enthusiast Pommi. Hopefully the heel will heal and I get re-energized by all the adrenaline. Slacker. No denying it. I skipped the weekend sojourns. It was a bit rainy the weekend of Feb 2-3. But the rain could not wash away my antsy feeling as I sat there writing a bit of code for work. My body knew it, my mind knew it, there was a need, a need for speed. Sigh. Acknowledged. Dig in with the brain. Catch up with the work stuff. Bend down, straight leg and searing hot nails flamed up from my heel into my calf. Amazing how fast pain travels to the brain. Then gone again. Too many stairs at work. I lasted ten days off before I caved into my needs. The weather was dazzling on Saturday Feb 9, 2008. I rationalized that it didn't hurt when I cycled. So cycle I did. Besides the spouse was out of town I could get on the road earlier on Saturday. It was warm 55F when I left at 8:21. Two guys in khaki shorts and mountain bikes fell in and behind me at the street light and the horse corral. They quickly dropped off my tail as well. I stopped at the turn out just by Monroe Truck Trail and chatted with a mountain biker who asked about the two guys I had seen. They are coming. Then he noticed that a couple of other mountain bikers had quickly turned around and were exiting Monroe. We went over for a debrief. Washed out. No clear trail. One fellow had taken "Poop-out" trail at Big Dalton and GMR and came down MTT. The other alternative was a 2.5 hour ride up GMR to reach the top of Monroe and ride down. Good estimate of time. But too ambitious for me today. The 7.5 inches of rain in December/January have really made a mark on the ecology. I realized I haven't been on the trail for nearly a year. It was a slow ride for me. I felt "alone". And yes, let me think, yes amazingly yes, no motorcycles. A few cyclists sailed by on the way up. The sun was bright and I realized I had forgotten the sunscreen. It was an ok ride. No camera. no pictures. Being outside was heavenly. Summer was already here. What happened to spring? The crowd coming up as I was going down looked like they could use the exercise. I thought I saw a few more Christmas pounds on Saturday. Some good groups were surging upwards. My heel did complain after I got home. Frozen peas for you! Still in the bag. The pain was a bit more active so it was easy decision to make Sunday a no ride day. Perhaps the elliptical trainer will get a bit of use on Tuesday night. I keep track of Pommi every now and again. I noticed he posted 110 miles as of Feb 1st. For me -- 124 outdoor miles plus the 13.4 on Saturday. Grand total of 137.4 miles. 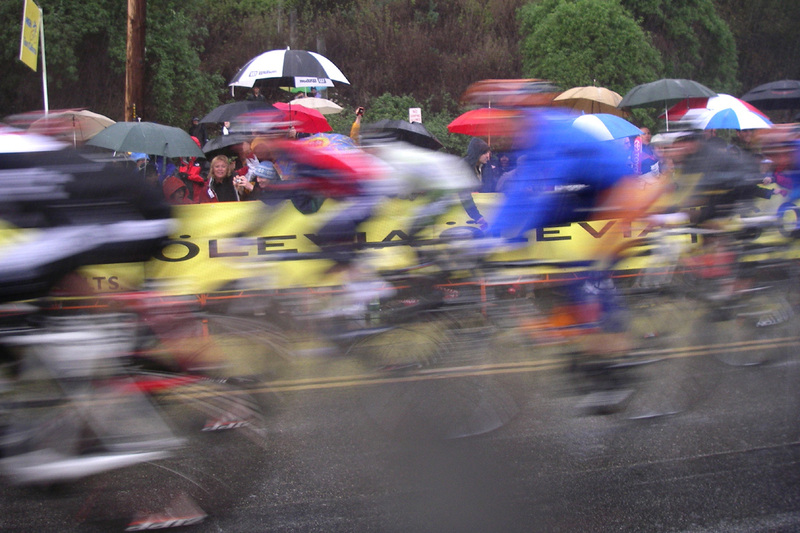 Palo Alto is next Sunday and the opening of the 2008 Tour of California!